Those who undertake official duties are members of The Queen’s close family: her children, grandchildren and their spouses, and The Queen’s cousins (the children of King George VI’s brothers) and their spouses. Every year the Royal Family as a whole carries out over 2,000 official engagements throughout the UK and worldwide. They play an important role in supporting and encouraging the public and charity sectors. About 3,000 organisations list a member of the Royal Family as patron or president. The huge range of these organisations – covering every subject from education to the environment, hospitals to housing – allows members of the Royal Family to meet people from a wide spectrum of national and local life, and to understand their interests, problems and concerns. 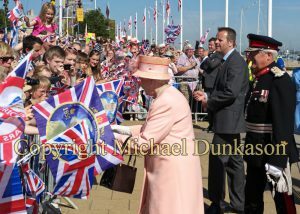 The Royal Family have visited the Island on many occasions, details of some of these visits can be found here.